GPS Unit 3C - American Politics Notes for the whole of paper 3 for American Politics including Elections, Political Parties, Racial and Ethnic Policies and Pressure Groups. GUARANTEED THIS IS ALL THE THEORY YOU NEED FOR THE EXAM. I am an A* politics student and this gets me consistently 90 % in all practice papers (though after February 2016 some examples may be outdated in favour of more recent ones, all theory however, is still relevant) [UPDATE SEPTEMBER 2017:] I got A* at A-Level with 100% in Unit 3. Congress - Complete Revision Notes Complete revision notes for the Unit 4 side of the US Politics A Level course. These notes were created using multiple textbooks, websites, books, articles, journals and undergraduate essays. They contain content beyond the level required to achieve a top grade at A2 level politics, and include substantial evidence, case studies and intellectual theories. I achieved 100 UMS at A Level politics, with these notes providing the necessary content for me to achieve the grade I did. Each module has roughly 12 pages of detailed notes in size 12 font, with quotations in italics and a different colour for them to stand out. Pressure groups - complete revision notes Complete revision notes for the Unit 4 side of the US Politics A Level course. These notes were created using multiple textbooks, websites, books, articles, journals and undergraduate essays. They contain content beyond the level required to achieve a top grade at A2 level politics, and include substantial evidence, case studies and intellectual theories. I achieved 100 UMS at A Level politics, with these notes providing the necessary content for me to achieve the grade I did. Each module has roughly 12 pages of detailed notes in size 12 font, with quotations in italics and a different colour for them to stand out. US Political Parties - complete revision notes Complete revision notes for the Unit 4 side of the US Politics A Level course. These notes were created using multiple textbooks, websites, books, articles, journals and undergraduate essays. They contain content beyond the level required to achieve a top grade at A2 level politics, and include substantial evidence, case studies and intellectual theories. I achieved 100 UMS at A Level politics, with these notes providing the necessary content for me to achieve the grade I did. Each module has roughly 12 pages of detailed notes in size 12 font, with quotations in italics and a different colour for them to stand out. The US Presidency - Complete Revision Notes Complete revision notes for the Unit 4 side of the US Politics A Level course. These notes were created using multiple textbooks, websites, books, articles, journals and undergraduate essays. They contain content beyond the level required to achieve a top grade at A2 level politics, and include substantial evidence, case studies and intellectual theories. I achieved 100 UMS at A Level politics, with these notes providing the necessary content for me to achieve the grade I did. Each module has roughly 12 pages of detailed notes in size 12 font, with quotations in italics and a different colour for them to stand out. Racial and ethnic politics - complete revision notes Complete revision notes for the Unit 4 side of the US Politics A Level course. These notes were created using multiple textbooks, websites, books, articles, journals and undergraduate essays. They contain content beyond the level required to achieve a top grade at A2 level politics, and include substantial evidence, case studies and intellectual theories. I achieved 100 UMS at A Level politics, with these notes providing the necessary content for me to achieve the grade I did. Each module has roughly 12 pages of detailed notes in size 12 font, with quotations in italics and a different colour for them to stand out. The Supreme Court - Complete Revision Notes Complete revision notes for the Unit 4 side of the US Politics A Level course. These notes were created using multiple textbooks, websites, books, articles, journals and undergraduate essays. They contain content beyond the level required to achieve a top grade at A2 level politics, and include substantial evidence, case studies and intellectual theories. I achieved 100 UMS at A Level politics, with these notes providing the necessary content for me to achieve the grade I did. Each module has roughly 12 pages of detailed notes in size 12 font, with quotations in italics and a different colour for them to stand out. US Political Parties - Unit 3C Government & Politics Summary of US Political Parties from Edexecel GCE Government & Politics Unit 3C Processes in the USA. Taken from classroom notes, lectures, Anthony J. Bennett's "US Government & Politics", David McKay's "American Politics & Society" & Edexecel Government & Politics Student Unit Guide. US Congress - Unit 4C Government & Politics Summary of US Congress from Edexecel GCE Government & Politics Unit 4C Governing the USA. Taken from classroom notes, lectures, Anthony J. Bennett's "US Government & Politics", David McKay's "American Politics & Society" & Edexecel Government & Politics Student Unit Guide. Has the Supreme Court become too powerful? - essay plan Complete essay play; received 100 UMS at A2 level US Politics, and am now at University study Politics. This is a complete essay plan, structured in a way that splits up the questions thematically - rather than simply yes/no - and has substantial debate within each theme, supported by evidence, analysis and evaluation gathered from external reading. Congress essay plans Complete essay play; received 100 UMS at A2 level US Politics, and am now at University study Politics. This is a complete essay plan, structured in a way that splits up the questions thematically - rather than simply yes/no - and has substantial debate within each theme, supported by evidence, analysis and evaluation gathered from external reading. Presidential careers can never live up to expectations Top level answer to the 45 mark question: \"Presidential careers can never live up to expectations\". This essay was written in February 2018 so contains relevant examples. A* answer. Assess the significance of the exclusive powers of the Senate Top level answer to the 15 mark question: \"Assess the significance of the exclusive powers of the Senate\". Recieved 15/15. Is the modern presidency an imperial presidency? Complete essay play; received 100 UMS at A2 level US Politics, and am now at University study Politics. This is a complete essay plan, structured in a way that splits up the questions thematically - rather than simply yes/no - and has substantial debate within each theme, supported by evidence, analysis and evaluation gathered from external reading. To what extent do Presidents control foreign policy? - essay plan Complete essay play; received 100 UMS at A2 level US Politics, and am now at University study Politics. This is a complete essay plan, structured in a way that splits up the questions thematically - rather than simply yes/no - and has substantial debate within each theme, supported by evidence, analysis and evaluation gathered from external reading. Supreme Court 15 Markers - Fully answered Complete set of 15 markers on the Supreme Court; I achieved 100 UMS in the exam. Voting behaviour 10 and 30 mark example essays Example of a 10 mark and 30 mark essay, as would appear on the exam paper, for voting behaviour in the USA under the Politics of the USA part of the course. Both high marking essays. How significant is the theory of party decline? - essay plan Complete essay plan; received 100 UMS at A2 level US Politics, and am now at University study Politics. This is a complete essay plan, structured in a way that splits up the questions thematically - rather than simply yes/no - and has substantial debate within each theme, supported by evidence, analysis and evaluation gathered from external reading. 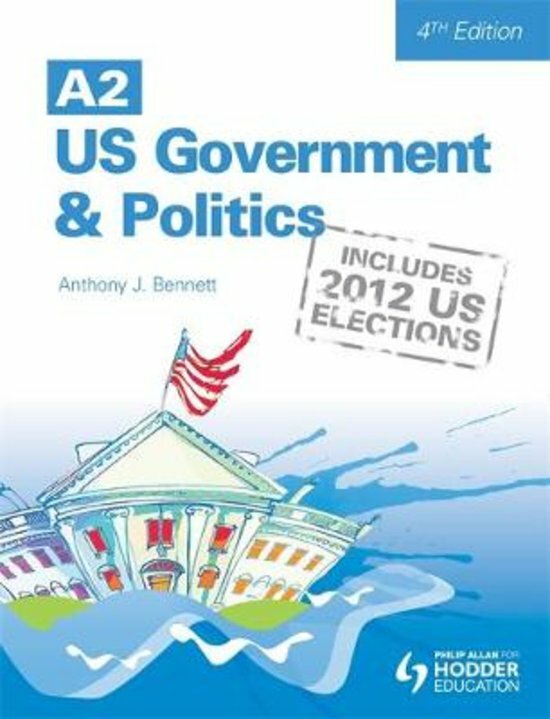 On this page you find summaries, notes, study guides and many more for the study book A2 US Government and Politics, written by Anthony J. Bennett. The summaries are written by students themselves, which gives you the best possible insight into what is important to study about this book. Subjects like politics, revision, a level, government, supreme court, congress, notes & president will be dealt with.